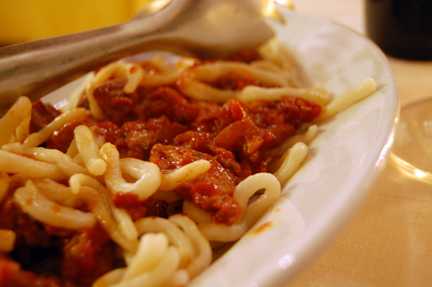 Pici al ragù (di manzo, beef ragù). Normally I’d have the wild boar ragù but I didn’t want to get carried away (literally). The 2004 Brunello Riserva Paganelli (cru) by Il Poggione was INSANE! Such bright acidity, such chewy red fruit, equine tannins, indomitable but delicious nonetheless! Normally we’d have the bistecca alla fiorentina but today it was a mere beef filet (blood rare, of course) topped with a grilled mushroom cap. Just in case, we also had a roast mushroom cap. Wherever I lay my hat these days, I am reminded that Texas is my home (for MELVIN CROAKER). Wow, thanks, everyone, for all the wonderful comments and emails about yesterday’s post on dinner in the home of the lovely Bindocci family in Sant’Angelo in Colle (Montalcino, Siena). I thought I’d post a few more photos from the dinner. And thanks, especially, to Stefania and Fabrizio, who so graciously welcomed us into their home. That’s Stefania, above, slicing the chestnut-flour polenta with a string. The incredible sensual experience of the chestnut-flour polenta is its combination of its sweet, chestnut flavor combined with its inimitable texture. The night we were invited, Fabrizio’s niece was there with her husband. They had just returned from Libya, where they had been living (they’re agricultural engineers and they work to create sustainable farming in the third world). To celebrate their return, Stefania had created this traditional Mt. Amiata menu (she was born in the mountains, while Fabrizio was born on the Orcia River Valley floor). @BrooklynGuy the delicate but firm-to-the-bite texture of the pork facial glands (almost like candy), which have imparted their flavor to their cooking liquid, combined with the pillowy softness of the polenta was an unforgettable sensorial event in our mouths. The porousness of the polenta proved an ideal receptacle and medium for the rich jus of the offal. The two worked in concert, in a dynamic dialectic that rewarded the senses with its seamless ingenuity. In another era, the slaughter of a pig was an important event in the familial and societal rhythm of life. While most of the pork was “put up,” as they say here in Texas, in the form of cured thigh and sausage, the offal was consumed in celebration of the good fortune of avere le bestie, as they say in Italian, of having beasts (i.e., livestock) on your estate. One of the coolest things about Il Poggione is that it is a working, integrated farm, where livestock is raised and sent to pasture in fields adjacent to the vineyards and olive groves. The integrated approach, says Fabrizio, is an important element in creating the terroir-driven wines for which their winery is so famous. We paired the 2006 “owner-selection” Rosso di Montalcino with the chesnut-flour polenta and pork facial glands (we served the 07 Rosso di Montalcino by Il Poggione at our wedding reception). Some of the most memorable meals I’ve had in Tuscany have been centered around pig and boar liver. It’s so important to experience the wines of Montalcino (and Sangiovese in general) in the context of food and pairing. The 2001 Brunello by Il Poggione was such a fantastic wine — a great vintage from a great producer. But the greatest treat was to taste it in the context and flavor “economy” of traditional pairings. The tannin, red fruit, and acidity of Il Poggione’s Brunello, paired with nearly impenetrable richness and deep flavor of the liver, assumed a new ontographical significance, by which, I mean our ability to describe the nature and essence of things. The second night and second dinner of our stay in Tuscany, we had the great pleasure of being invited into the home Stefania and Fabrizio Bindocci in Sant’Angelo in Colle. I’ve known Fabrizio, the winemaker at Tenuta Il Poggione, for many years now and Tracie P and I were thrilled to get to taste his wife’s cooking. “We’re not having ‘Tuscan’ food,” joked Fabrizio when he invited us. “We’re having ‘mountain’ food,” he said. He met his wife, he told us, when he attended a dance as a young man on Mt. Amiata (to the south of Montalcino and Sant’Angelo in Colle). There were no women in the valley back then, he joked. Dinner began with a nice light chickpea soup, accompanied by Sbrancato, a Sangiovese rosé produced by Il Poggione. Next came a dish I’d never had before: chestnut flour polenta, a classic dish of the Tuscan mountains, said Fabrizio and wife Stefania. She used a string to slice the individual portions. Fabrizio’s son Alessandro authors a blog about Brunello and life in Sant’Angelo, where he has posted about the pigs they raise at Il Poggione. We dressed the chestnut flour polenta with facial glands (above), butchered from the estate-raised pigs. Next came the true “stick to your ribs” dish: pig liver wrapped in caul fat. The liver was followed by sausage made from other organs, the darker of the two was spicy. To my knowledge, Il Poggione was the only producer to make a “riserva” Brunello in 2003, an extremely difficult vintage throughout Europe because of the heat and lack of rain. Brunello di Montalcino does not allow irrigation (not even emergency irrigation). But the elevation of the vineyards and their age (and thus the depth of the roots, which allows the vine to find the water table even in drought years) made it possible for Il Poggione to make a superb expression of Sangiovese despite the growing conditions. This was my first taste of the 03 Riserva, which is the first vintage that the winery has labeled as its “cru” Paganelli (the oldest vineyard on the estate, with vines more than 40 years old, and the source of the clones that inform the estate’s identity). The 03 Paganelli was superb: its fruit was bolder than most vintages I’ve tasted from Il Poggione, but the surprisingly powerful tannin and acidity kept the fruit in check. Very impressive. The 2001? To my palate, that’s one of the greatest vintages for Brunello in recent memory. The wine was unbelievably good, nearly perfect I’d say, a glorious balance of fruit, tannin, and acidity, with many years ahead of it but already showing gorgeously — and what a wonderful opportunity to taste it a stone’s throw from the estate, with the winemaker, paired with his wife’s traditional cuisine! Winter means fresh chicory as a side dish in Tuscany, red and green chicory, dressed with the estate’s olive oil. What Tuscan meal would be complete without castagnaccio, a short bread made with chestnut flour, topped with pine nuts and rosemary, for dessert? @ trattoria il pozzo in sant’angelo in colle (montalcino) last night. The star of an amazing menu. Pici or pinci are hand-rolled long noodles made using only flour and water. The magic lies in how they absorb the savory components of the sauce.